Special Offer: $50 spa credit per adult, per day. Restrictions apply. Honeymooners: Bottle of sparkling wine, romantic breakfast in bed morning after arrival and a romantic dinner for two on suite’s terrace (minimum 5 night stay). 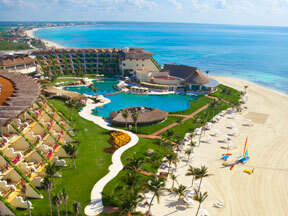 Spend an unforgettable vacation enjoying the secluded, natural beauty of Mexico. Nestled between the white sands of Playa del Carmen and set in over 80-acres of protected mangroves, jungle and cenotes, Grand Velas All Suites & Spa Resort is the ultimate all-inclusive resort offering you the best of the Riviera Maya, with over 1,000 feet of exclusive beach. 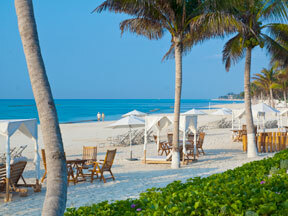 Delight in the luxurious white sand and clear turquoise waters of the Caribbean. The attentive staff will make sure you are continuously provided with refreshing beverages, gourmet snacks, fresh towels and cooling shade. Enjoy relaxation as you lounge by the ocean and submerge in the crystalline waters of the Caribbean Sea at this amazing resort. Grand Velas All Suites & Spa Resort offers a variety of activities and entertainment for family members of every age and every interest. All inclusive indulgences include poolside and beach waiter service, daily sports and activities programs, yoga, Pilates and tai chi classes and more. A supervised complimentary kid’s club provides a variety of fun daily activities to keep the kids entertained. 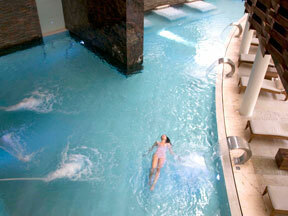 Surrender to blissful rejuvenation at the world-class spa. Surrounded by the lush jungle, the 75,000 sf. spa is a tranquil escape featuring 40 private spa suites and a menu of treatments inspired by the ancient healing practices of Mexico and distinct world cultures. From the delights of traditional cuisine to new takes on French dishes and Asian fusion specialties, eight gourmet restaurants offer an adventure for your taste buds, along with family favorites such as gourmet pizzas. Grand Velas All Suites & Spa Resort also provides the luxury of 24-hour in-suite dining, snack bars, poolside bars and trendy lounges featuring nightly entertainment. Each of the 491 spacious suites at Grand Velas All Suites & Spa Resort is elegantly decorated with upscale furnishings complemented by native artwork and feature deluxe bath amenities, plush bedding, flat screen televisions, personalized butler services and terraces with stunning views.